“But God demonstrates His own love toward us, in that while we were yet sinners, Christ died for us.” – Romans 5:8. We’ve had a very active last few weeks as we prepare for our stay in America next month. In addition to the normal moving across the world activities, we’ve also been on the receiving end of many blessings from our friends and family. Our local church family has been very helpful in every area of this transition and our family at Grace House has given us great encouragement and motivation in all things, including seeing them again as soon as possible. We are also thankful for all God continues to do in our lives, especially as we reflect upon the life, death and resurrection of Jesus Christ. May you also find renewed strength as you remember His love demonstrated towards you on the cross and the amazing promises He has for us. There has been so much to be thankful for as we’ve seen God do great things at Grace House. One highlight, which is no small thing, was we had the joy and privilege of baptizing four of our kids as they stepped out in obedience to follow Jesus! We had several great worship and fellowship times with the local church and with the kids. This also included the first communion service for the newly baptized believers. And since the kids enjoyed last month’s hamburger dinner so much, we decided to treat them to a special hot dog grill out. Surprisingly, most of them really liked cheese! This was followed up by their favorite game, bingo. As we said ‘We’ll see you again’ and ‘Have a good journey’ to each other, we know we are leaving the kids in good hands with our ministry partners and the wonderful house parents, UN and Elizabeth. We are also thankful that we will still be interacting with the kids through video chat and hopefully a trip every so often too. More so than that, we know God has great plans for His people and He will continue building His church here and throughout the region. There is one area we are expanding our involvement immediately and that is with the village school. The main sponsor for the village recently cut their support and we are now looking for sponsors to help all the village kids living there to get an education. So please be in prayer for the school sponsors and for the kids to continue to grow in their understanding and faith in Christ. An update on the prayer request from the last few months is that many of the Pa-Oh and Shan in our church have been able to find new jobs at a well-known company. They, and us as well, are very grateful for this! They are still in proceedings concerning their last employer and the lost wages so please keep lifting them up in prayer. We have still been meeting with our cell groups, not only to make arrangements to see each other before our departure but also for encouraging them to keep seeking God for the journey ahead. 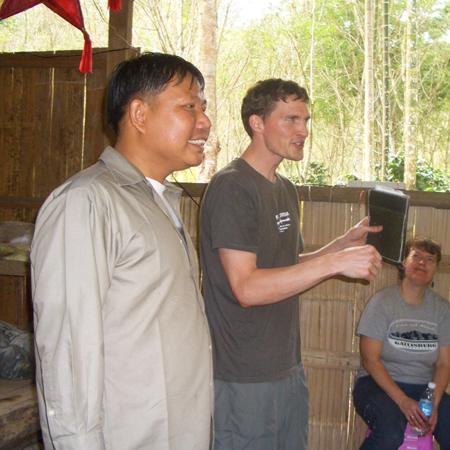 We are thankful that Christ is building His church here and there is already a healthy church body of Pa-Oh & Shan believers in addition to the local Thais. We are of course thankful that God has done much in the past 6 years and He is still at work in mighty ways here. We look forward to our coming stay in the US, our upcoming studies, and our continued involvement in the ministry here. Thank you to all of you for your partnership in transforming lives!